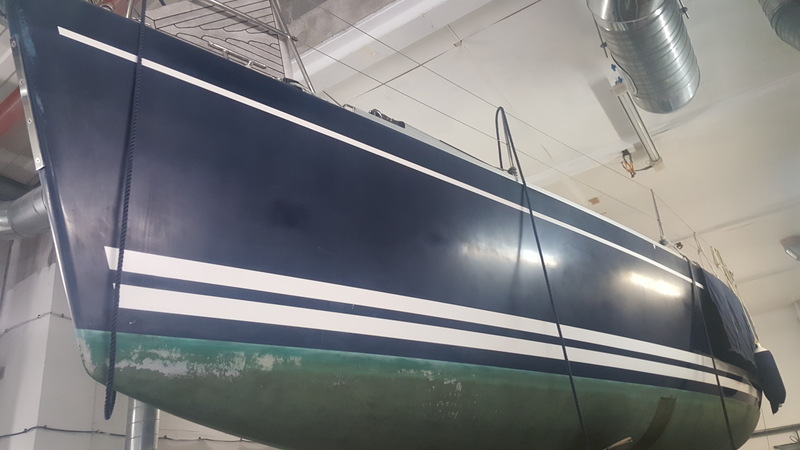 Whether your boat needs a complete re-spray or simply a small repair, we can get the job done using top of the range Awlgrip paint products. 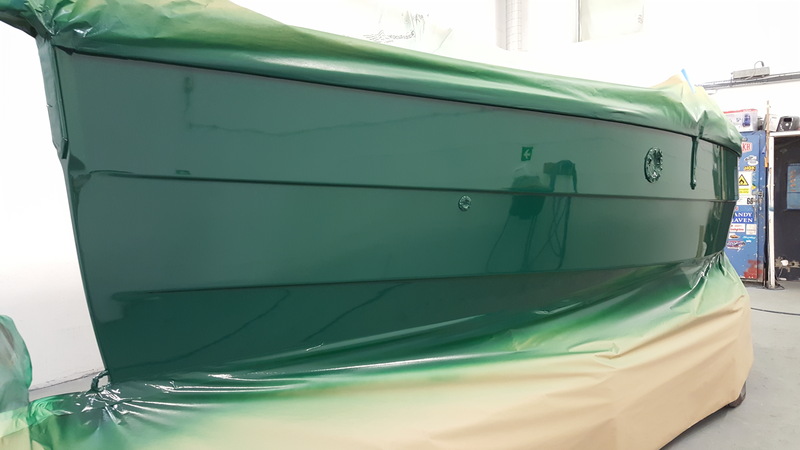 Our clean, environmentally controlled sprayshop boasts state-of-the-art features, such as temperature/humidity control and dust extraction, to ensure that our highly skilled team achieve the best possible finish every time. 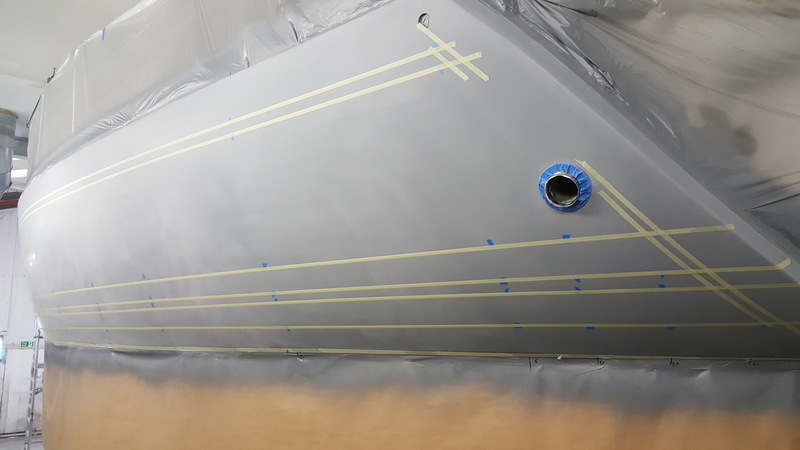 Awlgrip finishing systems will leave your boat with a mirror-finish at the same time as protecting it against the elements. 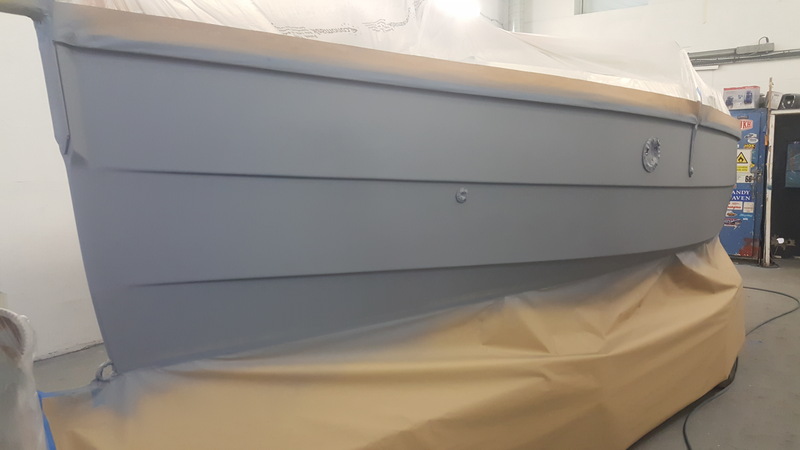 Our experienced team of sprayers and finishers are always available to lend free and impartial advice – just ask. 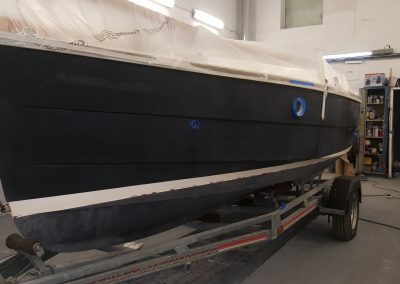 When she came to us, CERYS’ hull was black and it had badly lost its sheen. 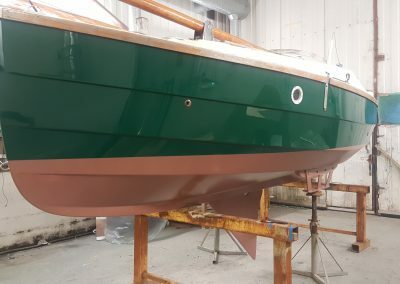 Her owner, Mr John Bowen, decided he wanted to completely change the hull colour to green. 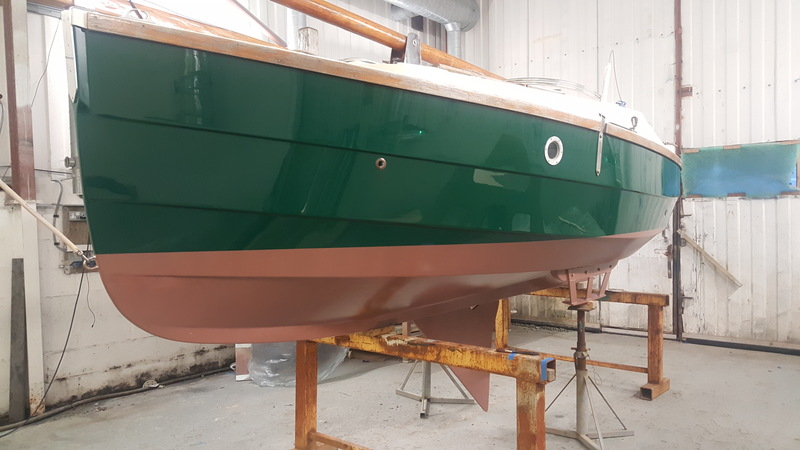 After discussions with and recommendations from our experienced sprayer Stevie, it was agreed that we should respray the hull using Jade Mist Green Topcoat and also Coppercoat the bottom to protect it for the future. 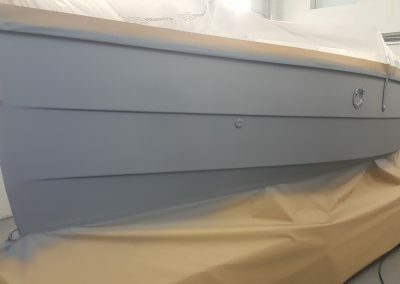 Mr Bowen also took advantage of our skilled craftsmen to have Cerys’ timber work varnished whilst his boat was in our workshop. “She did look slightly scruffy when I first had her. When she was put back in her berth this year I had the comment – “I see that you have gone for a new “Shrimper”. I think that says enough. In fact, if I had a new boat it might be worth having you give her a refurb! Once again, thank you for my “new” boat“. 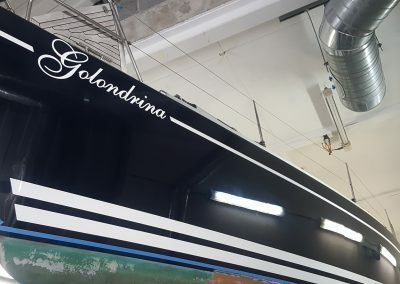 Another successful respray project, Golondrina was dull when she arrived here, but after being primed, painted and given some coppercoat repair work, she left us in pristine condition. 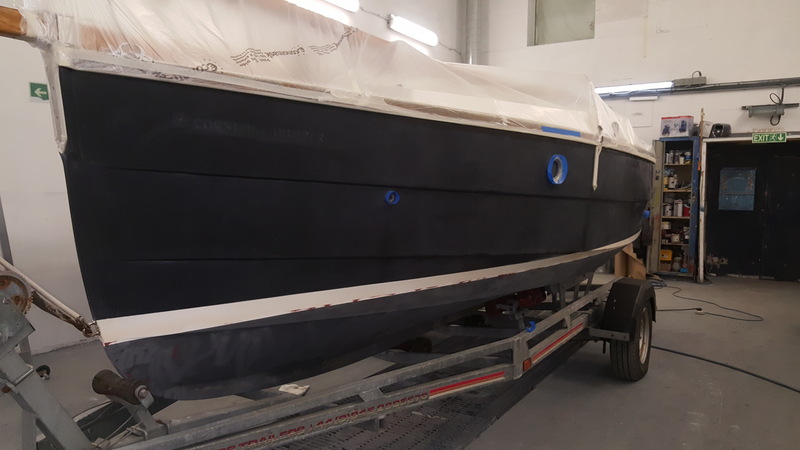 Mr Gareth Williams, the owner, discussed his wishes with Carl and his team and it was decided to use Awlcraft 2000 Midnight Blue Topcoat, with a clear coat over the top to provide a mirror-like result. 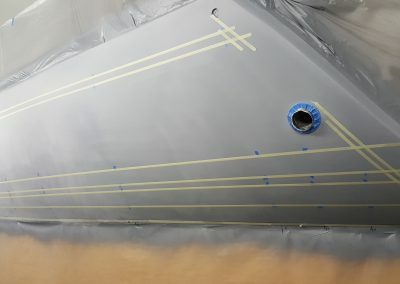 “I have been a regular and grateful customer of Dale Sailing for many years. 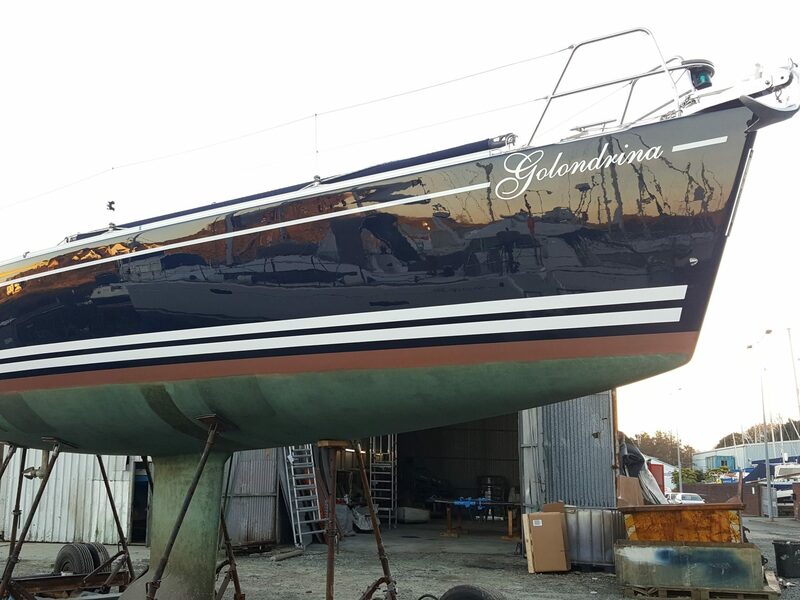 They provide a comprehensive service to meet the needs of any serious yachtsman. A big advantage is that they are immediately at hand and always keen to help, and they have a core of experienced and very skilful staff. 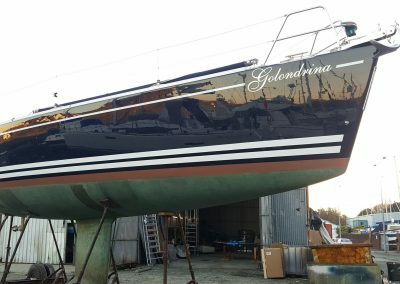 This was much in evidence when my 40′ Arcona yacht was resprayed recently. 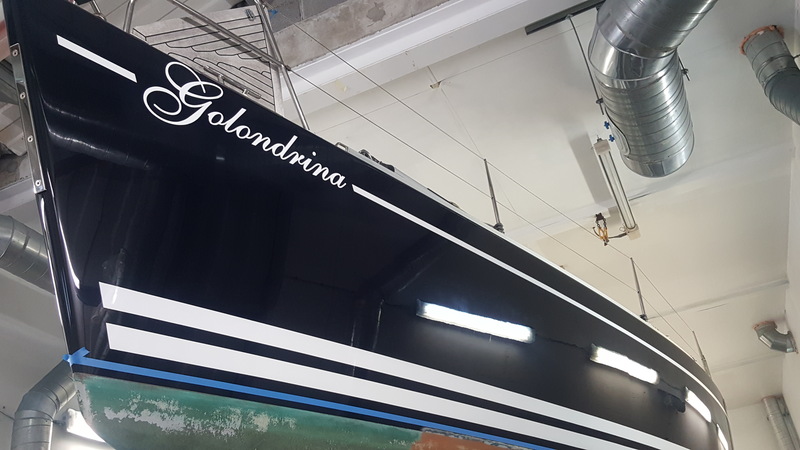 She is a beautiful boat that’s done a lot of offshore and ocean sailing. 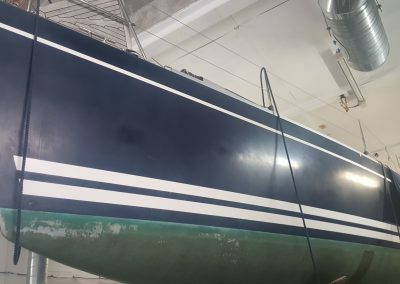 Eight years old, the gel coat was looking a bit tired and I wanted to preserve her beauty – the respray was performed in optimum conditions, meticulously and carefully. Her appearance is now staggering and draws many complementary comments. I am delighted! Thank you Dale Sailing”. 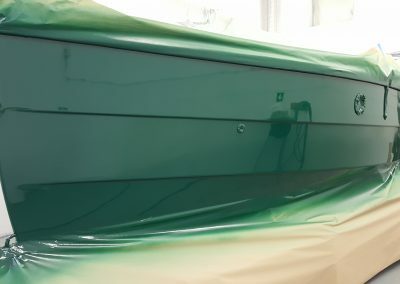 Chat with Carl to find about how we can transform the look of your boat, and make it the envy of the marina!